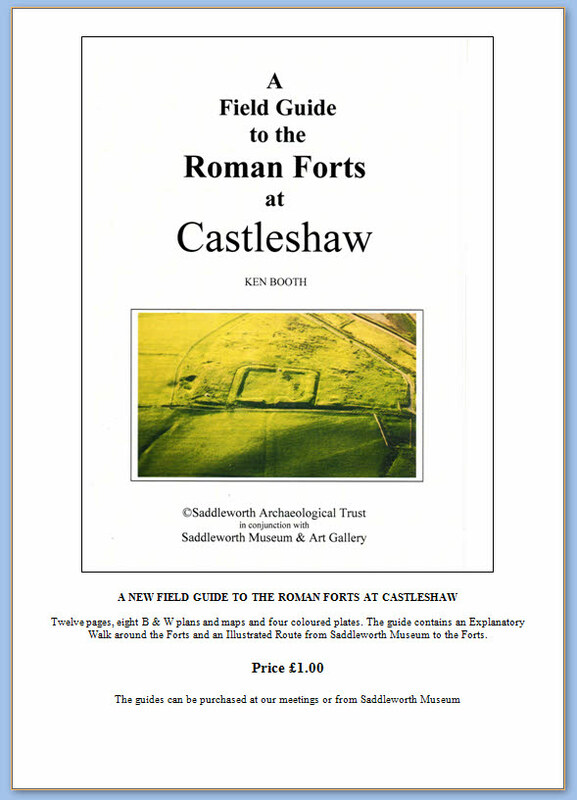 The Friends of Castleshaw Roman Forts (FCRF) is a group set up to help look after the site and get people involved in the various initiatives and events which have come out of the Conservation Management Plan. Please have a look at their leaflet here. 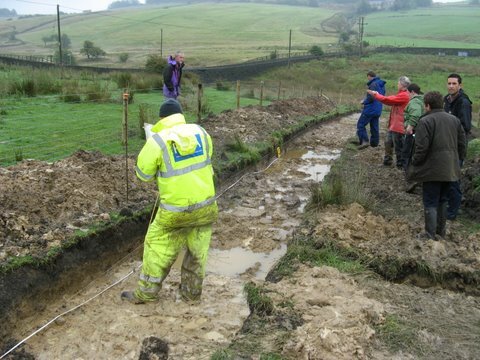 Earlier this year United Utilities dug a trench across the Roman Road near Castleshaw. I suspect that the muddy conditions didn't help. The March/April edition of "Around Saddleworth Magazine" contained an excellent article detailing the aims of the trust and photos of some of the publications. This is the first issue of this newspaper and we have an article headed 'Join the Time Team'. This is very much a recruitment article to try and increase our membership. It does cover our publications and lectures. 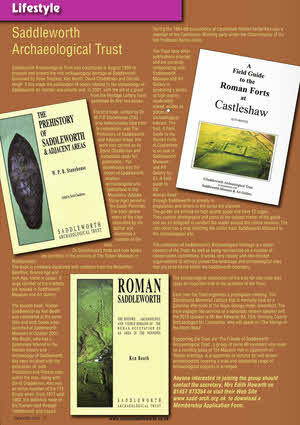 A new field guide to Castleshaw Roman Forts has been produced by Ken Booth and is available from Saddleworth Museum or from the Trusts meetings. We are very sad to announce the death in Scotland of both Edmund and Adeline Clark. Before moving to Tarbet they lived on Carr Lane, Uppermill where they hosted the most magnificent New Years Eve Parties. They moved to Tarbet when Edmund retired and in recent years were visited by Ken and Barbara Booth, in the summer months, when they joinly explored the Kilmartin Valley. In view of the fact that Manchester University have closed the Field Archaeology Department, excavations at Buckton Castle have not taken place in 2009. Dr. Mike Nevell, Director of the excavations has taken a similar post with a new department at Salford University and excavations will resume at Buckton in 2010. 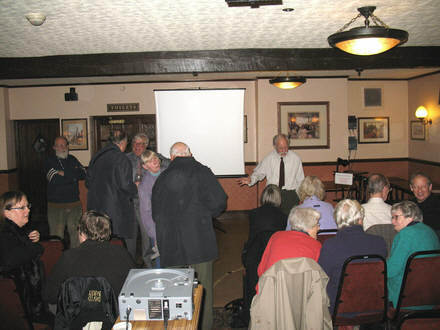 Because of the above, Norman Redhead will not be able to tell us about Bucton in December and instead will give a talk entitled ‘Recent Investigations in Greater Manchester and the Historic Environment Record’. 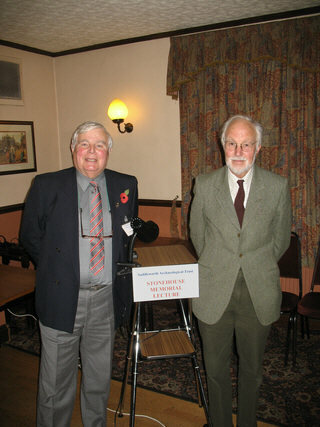 Ken Booth (left) with Dr. John Peter Wild F.S.A. Hon. Research Fellow in Archaeology and Joint Director of the Manchester Ancient Textile Unit,University of Manchester. 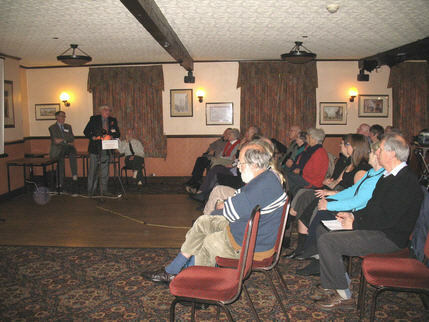 Chairman of the Nene Valley Archaeological Trust. This years Stonehouse lecture was very well attended to hear a fascinating lecture about "The archaeology of cotton, digging in Roman Egypt." Specifically covering the textiles recovered from the Egyptian Roman Red Sea costal port of Bereneke and their designs and origins, Dr Wild gave details of how simple clues such as to the direction of twist in fibres can help identify the origin of materials. The lecture was richly illustrated with cotton fabric examples from this and other sites in Egypt.